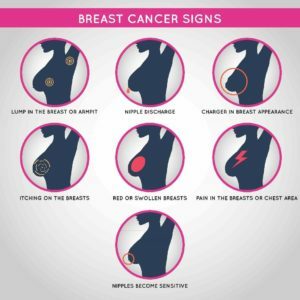 What is Breast Cancer and how is it treated? Breast cancer is the growth of malignant cells (cancerous cells) in the breast. These cells grow and spread rapidly and uncontrollably. Although it mostly affects women, accounting for 25% of cancers in women, men can also get breast cancer. Most men however, get checked when the symptoms are severe. Though the cause of breast cancer, just as many other cancers, is unknown, there are some risk factors that are said to increase the chance of a person getting this type of cancer. Radiotherapy which involves using high energy beams directed to the affected part to kill cancer cells. Chemotherapy which is the administering of a combination of anti- cancer drugs to kill the cancer cells. Hormone therapy that involves using drugs to prevent the already growing cancer cells from getting the hormones they need to continue growing. Target therapy that involves using drugs to target specific cancer cells without causing damage to normal cells can also be used in breast cancer treatment. Immunotherapy is a newly approved cancer treatment option that makes the body’s immune system aware of the presence of cancer cells in the body, improving the body’s immunity and therefore being able to fight the cancer. Checking yourself regularly is important and if you find a lump, you should see a local doctor as soon as possible. Getting screened for breast cancer regularly is important not only because you are able to tell whether you have the cancer or not, but also because it can be detected at an early stage which makes it more effective and cheaper to treat. International Medical Treatment Ltd (IMT), can link you with our partner hospitals around the world, that offer advanced diagnostic and treatment options for breast cancer. Treating breast cancer in its early stages is less costly and more likely to be successful. We, at International Medical Treatment (IMT), are experienced facilitators who can link you with the best breast cancer specialists in our partner hospitals in India, Dubai and Thailand.